Through the ages, Food & Drink magazine has been a constant voice in Ontario’s food and beverage landscape and it’s always there when you need it most. Before I could put the words or thumbs together to ask for food knowledge or conceptualize entertaining ideas, there was Food & Drink. Since we’re around the same age, I didn’t always understand the recipes at first but I fawned over pictures and began my education with each word. For every Ontarian, Food & Drink was and is ever-present. Like a fine wine, Food & Drink has matured into something different with the remarkably strong, same foundation. I look forward to watching it grow into the digital space and already a fan of their new Insta! And so! We celebrate. ToFoodies had the honour of attending not one, but two events to commemorate two very important anniversaries. It is with beautiful synchronism that the 25th anniversary of Food & Drink magazine is the same year as VQA’s 30th anniversary! First off, a group of wine partners and lovers alike were whisked away to Niagara-On-The-Lake, ON to experience a last squeeze of summer at Trius Winery. 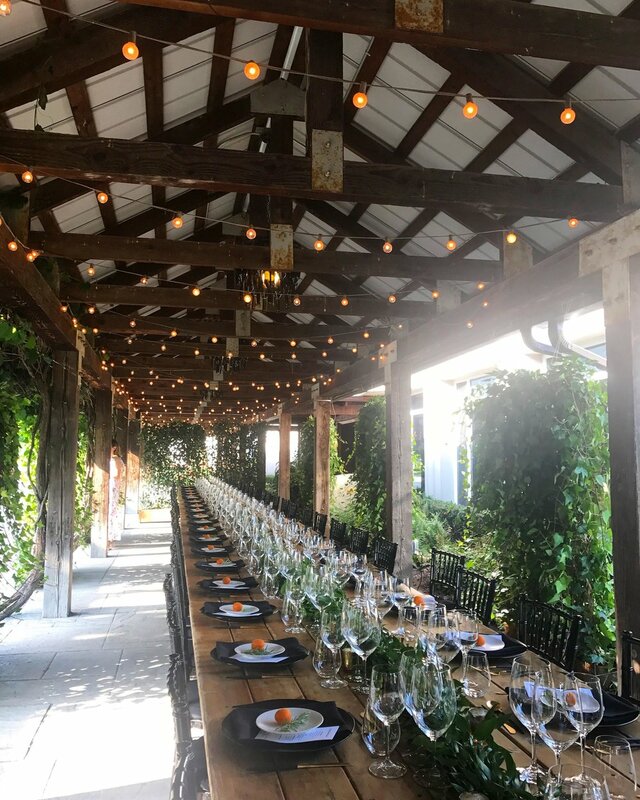 An outdoor oasis with a long dining area was set for our large crew, complete with a very exciting menu peeking out at each table setting. But first, we were treated to a walk around the property. Craig McDonald, Head Winemaker was first our host and he took us around the vines, sparkling wine caves and red wine barrel-aging rooms. All along the way, he couldn’t stop gushing for the VQA (Ontario’s Wine Authority) and how their support has made a world of difference to Niagara-On-The-Lake and the Ontario wine industry. VQA ensures that the wine is produced from 100% Ontario grown-grapes, approved through a strict quality assurance program. McDonald works at Trius - Australian accent and all- because he finds both the land and the opportunity in Ontario so inspiring and gratifying. There are also the Lake Erie North Shore and Prince Edward County wine regions to discover! VQA is where it’s at! Dinner was pure orchestration of Ontario goodness. Started off with an Ontario summer melon lobster salad with Hewitt’s Farm goat cheese croquettes, followed by a savoury pizzette with Cabernet-poached plums with Thornloe Devil’s Rock Cheese. My favourite course was the Artisan Farm ribeye steak with New Farm arugula pesto, shortrib canelloni and Ontario corn, just because it was so damn tasty. What’s not to love on that plate? But dessert was the real showstopper. Ontario blueberry cheesecake bars, frozen and dipped in chocolate with liquid nitrogen smoke pouring off the plate. Icewine blueberries! Insanity! After a last sample aperitif from the wine bar, we were off, back to Toronto. Within the month, #FoodandDrink25’s joy came to Toronto and this next event was no less impressive. Upon arrival at a chic Geary Ave. loft, we toggled between a wine-tasting session of a new red and white by Clarity, as well as a food-styling station. It was so fun to use all the props (see my food-styling set up in the first picture on the right, above) and lean on the Food & Drink food stylists that were there for help. “Is that too much side tomato?” was a legitimate question I found myself asking, before locking in that no side tomato would really be best. Perhaps most heartwarming of the evening, it was an opportunity for Ontario winemakers to be acknowledged and thanked as they stood up to describe their wine pairing with each course. As a food writer and photographer, I’ve been to many events where it’s all about the food and this case was no different, as we were eating the greatest hits from Food & Drink’s 25 years of recipe writing! However, equal footing was provided to the winemakers and I enjoyed hearing how Henry of Pelham for example, truly deeply thinks their rosé could go with any/everything and that they can barely keep it on the shelves! This is great thing to witness firsthand- how excited Ontarians are about their own, local stuff. As mentioned, the menu for this #VQAwithDinner featured favourite recipes by Food & Drink’s staff with the Cheddar Cups with Fresh Tomato Relish & Crispy Prosciutto, Roasted Garlic & Pumpkin Soup, Grilled Zucchini & Buffalo Mozzarella Salad, with the savoury finale of BBQ Lamb with Roasted Vegetables and Crispy Potato Chips. All of these are featured in the 25th Anniversary Collector’s Edition, and all of the recipes hold up splendidly in 2018. When ToFoodies first got our hands on the #FoodandDrink25 Edition, we couldn’t resist trying out the Plum and Blueberry Shooters at home. How happy and surprising it was to see the same dish featured as the dessert at our Toronto #VQAforDinner! If you want an easy to put together, sweet treat for your next dinner party… this is definitely the recipe for you. So luscious, nothing to bake but it won’t leave you feeling too full. Pick up a copy NOW your nearest LCBO, and then take your celebrations a step further by making one of the many recipes that span the ages of Food & Drink! Flip through the pages and let us know what is your #1 recipe! Cheers! Made with fresh & seasonal plums and blueberries, mascarpone, mint and pomegranate juice. In partnership with the LCBO.